Learn. Earn. Don't Get Burned. On Sunday 3 of February, I will release Gunbot v12.8.1 Stable with Bitmex included. 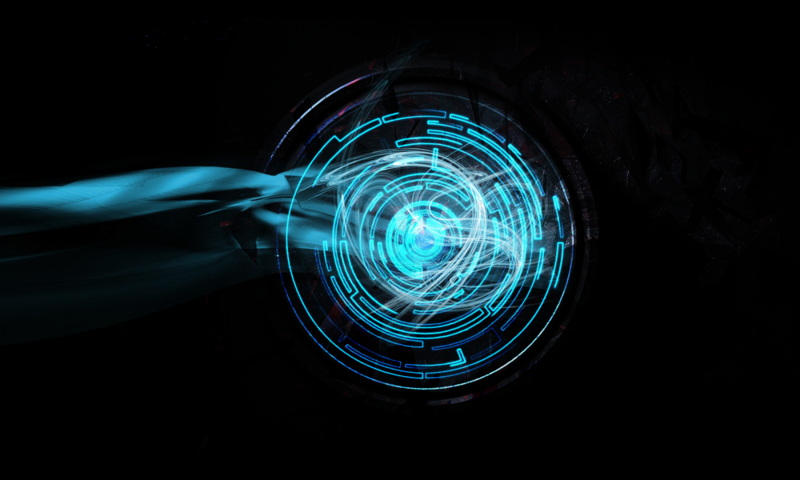 V12 includes a special feature that will connect your Gunbot over the blockchain and verify your license without need of a reseller to change your API keys i.e. and more. We’ve all been waiting for this for a very long time. Gunbot Version 12 brings *so* many new features. GBU LIVE featured Gunbot v12 in a recent subscriber-only webinar, where you can learn about it, see a demo, and more. Gunbot v12 looks fantastic, brings a ton of new functionality, and has been tested by hundreds of brave beta users. Read about all the new v12 features at the official Gunbot Wiki. Do you want to EARN YOUR CRYPTO? You can easily EARN YOUR CRYPTO by creating a free Affiliate account, requesting an Affiliate Share Code and then give them a special coupon made just for you. THEY get FREE Bitmex license when it comes out. 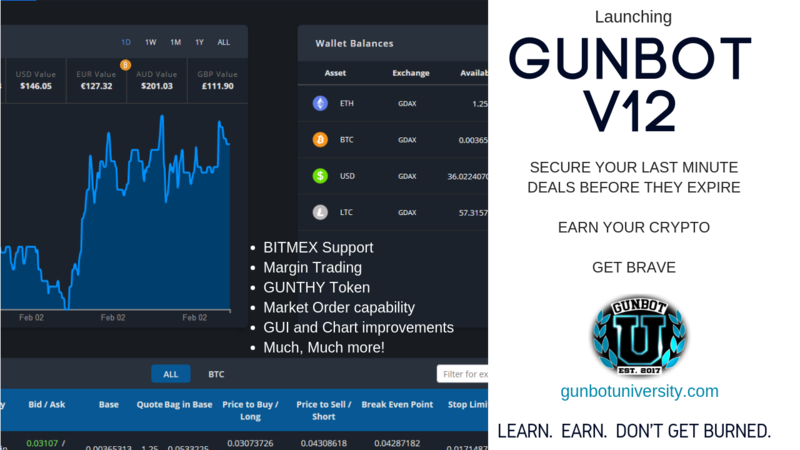 Not sure how to use GUNTHY Token? Get Brave! You can use most any ERC-20 capable wallet for the GUNTHY token, and the Brave Browser is fast, safe, ad-blocking and you can use the Metamask plugin safely. We recommend you separate your crypto-browsing from all the other browsing you do. This is an easy way to do that. [recommended] create a new dedicated Ethereum Wallet just for Gunthy. You can drop down your identity avatar and click + Create Account. Name it something easy to identify as Gunbot or Gunthy. 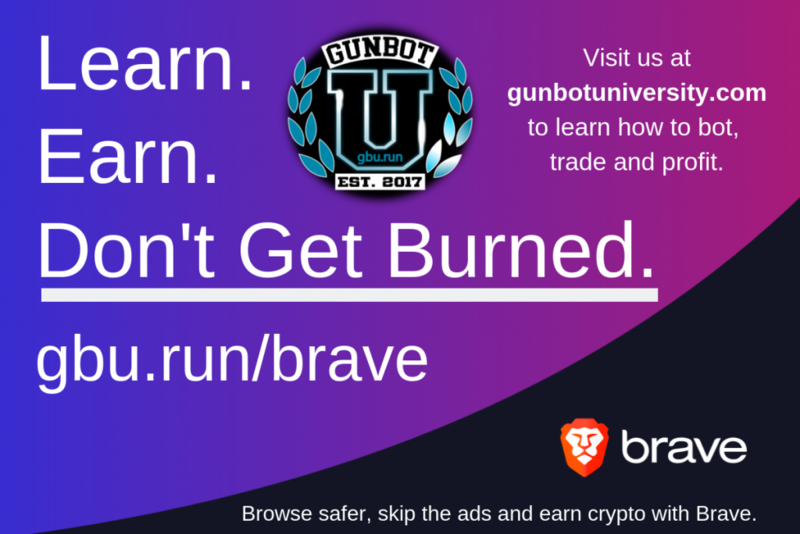 Buy or upgrade Gunbot TODAY. We accept Bitcoin, GUNTHY Token, Litecoin, DASH, Bitcoin Cash, Ethereum and Paypal. Tomorrow morning (Sunday 3 of February) I will release Gunbot v12.8.1 Stable with Bitmex included. Gunbot Version 12 brings *so* many new features. GBU LIVE featured Gunbot v12 in a recent webinar, where you can learn about it, see a demo, and more. Gunbot v12 looks fantastic, brings a ton of new functionality, and has been tested by hundreds of brave beta users. Secondly, free BITMEX license with purchase of Gunbot. When v12 launches, both of these promotions are gone. We return to our normal pricing. If you want to secure 50% discount, add 50% discount to our “Upgrade to Ultimate” deal (learn more at gbu.run/upgrade2ultimate), or get a free BITMEX license, you need to act NOW. 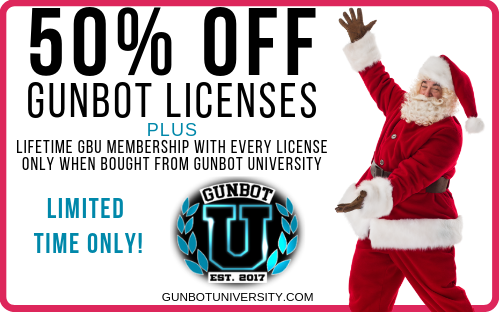 Have you already taken advantage of the discount, or you think you have as much Gunbot as you need? Do you have friends or family that could use these deals? THEY also get 5% off! Are you worried if you’ll make it in or not? If you create your order NOW, you secure your discount, and you can pay in a day or two. We accept Bitcoin, Litecoin, DASH, Bitcoin Cash, Ethereum and Paypal.